As a girl, I formed many notions about entrepreneurship by devouring every biography in my elementary school. I loved the stories about how a single person like Abraham Lincoln could influence the world. The founder of the Girl Scouts, Juliette Gordon Low, was notably in the group of innovators and leaders who inspired me with her life story. Thus I was thrilled to be asked to speak about being an entrepreneur at the 100th anniversary of the Girl Scouts for their National Convention in Houston. 1300 girls converged from all corners. They also organized their own Leadership Institute which was broadly assembled around the theme of Innovation and Leadership. It’s always hard to tell if a presentation or talk is “landing” with high school kids. They are yawning and chronically sleep-deprived. They are distracted by their phones. They don’t nod and smile like adults often do in a talk. But the sharp questions from these girls afterwards revealed that they hadn’t missed much from our panel. The girls swarmed afterwards for photos with the speakers. They kept pressing little trinkets into my hand. I didn’t understand the gifts until they explained their heart-warming tradition of giving each other things to collect and display. They are called SWAPS: Special Whatchamacallits Affectionately Pinned Somewhere. The giant George. 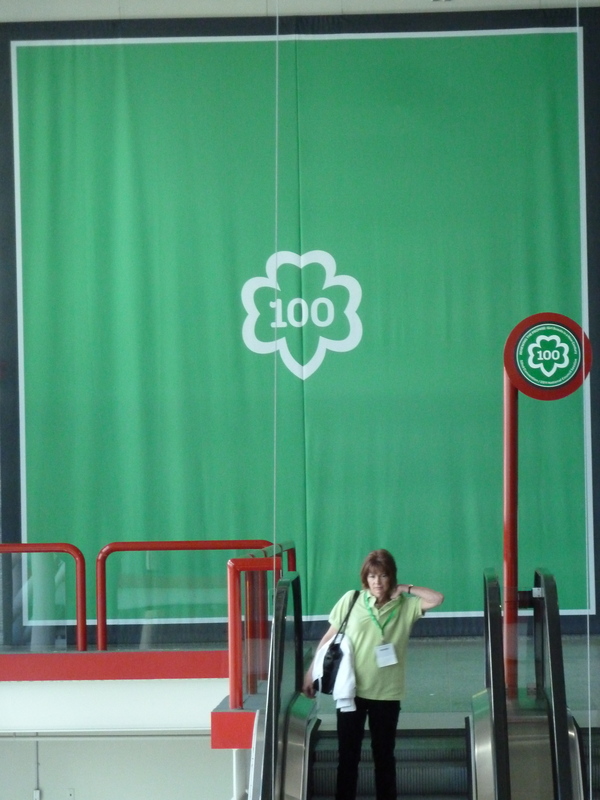 R. Brown Convention center was packed with events and inspiring photos of Girl Scouts and their history. The hundreds of adults on hand were equally engaged, and many dressed in coordinated outfits that helped their regional groups stand out. This Florida woman explained the little hats her group sported. They were meant to be a specific reference to the fashions of the times 100 years ago, with symbolic details of daisies (the founder’s nickname), her pearls, and also the navy color to represent the new Girl Scout uniform being released for the next 100 years. I participate in a lot of tech conferences and competitions. I typically only see one woman startup founder for every ten men who choose to compete or speak. I told the girls that they need to change that. Girls and women have to stop waiting to feel “ready” to create companies. I can tell you that these girls are ready. They are perfect.